And today I’m going to break down the “Nitty Gritty” of what you need to do in order to build muscle including how much food you should be eating, what foods you should consume each day, what are the top exercises to stimulate muscle growth and what you should do to see faster growth over time. Here’s my secret (well not so anymore) formula for building muscle. As you can see the first ingredient is “Proper Nutrition”. In other words, it’s not all about what you do in the gym (despite what you might think). It’s a well known fact that it takes roughly 3500 EXTRA calories to gain approximately 1lb (or .5 kg) of EXTRA muscle mass. So if you want to build muscle and gain weight your first goal is to consume extra calories on top of what your body burns each day. For example, if your body burns 2,000 calories each day then you’ll need to consume MORE than 2,000 calories a day to build muscle. Better example: let’s say you wanted to you wanted to gain 1 lb of muscle each week and your body burns 2,000 calories a day, theoretically all you’d need to do is consume 500 extra calories on top your normal 2,000 calories (that your body needs to get through a typical day) and you’ll gain 1 lb of muscle each week. Now there are several factors thats involved including the speed of your metabolism, nutrition sources (where your calories come from - every calorie isn’t created equal), intensity of your workouts, genetics... etc. But if your goal is to build muscle, this is how you go about it.... by consuming more calories. A better to say this is All Calories Are Not Created Equal. The truth is it takes approximately 3500 EXTRA calories to build 1 lb (or .5 kg) of new body mass. It all depends on where those extra calories come from that decide how much of those extra calories gets converted to muscle and how much is converted to fat. For example - if the majority of your EXTRA calories come from fats and bad carbs (i.e. from foods “like chips and soda”) you’ll gain mostly fat. But if the majority of your EXTRA calories come from protein and good carbs “like tuna and whole wheat bread” you’ll mostly gain muscle. Remember you should increase your calories with healthy whole food sources rather than from processed, artificial and unhealthy junk food sources. Check out my article on the Top Food to Build Muscle and Gain Weight for a full breakdown on what foods you should be consuming to build muscle fast. The next ingredient in this formula is INTENSE workouts. You NEED intense workouts if you want to build muscle. As much as I stress proper nutrition, what you do in the gym also plays a very significant role to building muscle. There are many different factors that go into an intense workout but the #1 muscle building factor is to Lift Heavy Weights. Your muscle gains (and strength gains) will be VERY small (if any) if you stay on the 10 and 15 lbs weights. So what do I mean by “lift heavy weights”? Well, I know your muscles perception of what’s heavy is way different from an athlete with years of weight lifting experience thinks of as heavy. So here’s the general guideline. Why is 6 - 12 reps the SWEET SPOT for building muscle? The reason for this has to do with your muscle fibers. Without getting too technical, you have two dominant types of skeletal muscle fibers in your body; Type I (slow twitch) and Type II (Fast twitch) muscle fibers. It just so happens that of these muscles your Type II muscle fibers grow the largest. These are the muscles that help sculpt your body. I usually have to explain the difference of why you need to lift heavy when I answer the common question of: Can I build muscle without a gym? So remember in order to build muscle fast you need Intense Workouts and by using the 6 - 12 reps weight training rep scheme you’ll experience the most amount of muscle growth. When you’re first starting out common sense might be telling you that the longer you stay in the gym lifting weights the bigger and stronger you’ll get. But guess what? The reality is, your body is on a time limit everytime you walk into the gym. Yes, there is a timer that starts the second you pick up the weights and do your first to the time you finish your workout. And guess what, the more time you spend after that timer runs out the less effective your results will be. In fact you may be even putting your muscles in danger of “shrinking”. So how long should I be working out for? The general rule of thumb when it comes to how long you should be weight training is no more than 60 minutes. In other words, if it takes you longer than 60 minutes to complete your weight training workout then you may be putting your muscle gains in jeopardy and you may be putting your muscle gains at risk. So remember, when it comes to weight training.... less is more. You’ll see way better results from “short and INTENSE Workouts” rather than Long, drawn out workouts. So be sure to keep your weight training sessions to no more than 60 minutes. Have you ever seen that guy in the gym that stays on the bicep curl machine, the tricep machine, the leg machine??? Whether you have or you haven’t, if you want to build muscle don’t be that guy. You NEED to do compound exercises. The name of the game when it comes to building muscle is muscle stimulation. While you’re in the gym you want to stimulate the most of amount of muscle in the least amount of time. Remember, “Short and INTENSE Workouts” are key to building muscle. With that being said, compound exercises stimulate way more muscle fibers than isolation exercises. So what are compound exercises? In a nutshell compound exercises are exercises that stimulate multiple muscle groups at the same time, whereas isolation exercises (i.e. - dumbbell curls, tricep extensions, etc) only target one muscle group at a time. If you ask any experienced weight lifter what are the top exercises to build muscle... ALL of them will be compound exercises. Despite what you might think, your muscles don’t grow in the gym... your muscles grow outside the gym. The majority of your muscle growth actually occurs while you’re asleep, this is when your body can dedicate the most amount of nutrients and cellular activity to muscle repair and growth. With that being said, what you do in between workouts is EXTREMELY important to building muscle. Most guys think their job starts and ends once they’re finished pumping iron, but when you look at how many hours you spend outside the gym, in some sense it’s just beginning. Eat when you’re supposed to eat and eat the things you know you're supposed to eat. Don’t skimp out on your meals, because once your workout is over, that’s when your body is prime for muscle growth. And it’s during this phase when all those calories are needed... for muscle repair and muscle growth. Make sure you get at least 8 hours of uninterrupted sleep EACH night. This helps promote the optimal amount of muscle building hormones during this crucial recovery period (while you’re sleep). This also means don’t overdo it. In between your workouts its vital that you limit the amount of strenuous activity you perform to help you muscle recover faster. Rest and recovery is important because your muscles only grow after they’ve fully recovered from the previous workout. This should go without saying but it’s VITAL to your success that you be consistent with your diet, your workouts and your rest and recovery. Your body is an “Adaptation Machine”. web security . The more your body adapts to something, the easier and more efficient it gets at doing it. And this is very important when it comes to building muscle. For example: when you first start following a proper muscle building diet, your body gradually adapt to your proper eating habits by speeding up your metabolism (which is good) to digest food quicker and repair your muscles faster which speeds up muscle growth. But if you slack off on your diet and you’re inconsistent with your meals, guess what your body will adapt to these “poor” eating habits by keeping your metabolism slow, thereby slowing down your digestion and your muscle repair and guess what these things all do??? You guessed it.... slows down your muscle growth. That’s the reason why “The Big Get Bigger” because they’re so consistent at doing all the right things that to their bodies, building muscle is almost effortless because everything has been adapted to build muscle faster and more efficient. You can get there too, all you have to do is be consistent. This is VERY important if you're looking to build "life changing" muscle. The last step to building muscle is to ENJOY IT! Building muscle takes weeks of doing and eating the “right” things inside the gym and outside the gym. So in order to build life changing muscle you have to stay committed and consistent and the only way to do that is to enjoy the process. Building muscle isn’t that hard. I transformed my body TWICE, you can checkout my SHOCKING transformation photos if you don't believe me and the second time was actually easier than the first, all because I followed these very same tips that I provided for you today. What was your favorite tip? Do you have a tip of your own you’d like to share? Do you have a question about any of the tips I’ve mentioned? Do you have any experiences you’d like to share about building muscle? I’d really love to hear what’s on your mind when it comes to building muscle or fitness in general so please leave me a comment and let me hear what’s on your mind and if you enjoyed this article. These 11 Mistakes Are "KILLING" Your Results and Keeping You SKINNY!!! 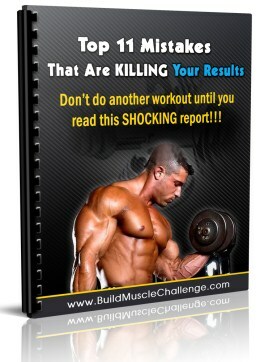 If you're a skinny guy, hard gainer, have a fast metabolism or struggle to build muscle and gain weight then you need to download this special report. If you want Instant Respect and Attention you NEED to get this report! Click here to download your Special Report Now... (while it’s still free)!! !